French dance music producer, Quentin Dombres or professionally known as Dombresky has been producing music for nearly a decade and a half. It took years for Dombresky to find his way out of local markets and onto the global level but that breakthrough occurred when he produced an official remix for A-Trak's 'We All Fall Down". From there, Dombresky's career started to explode; connecting the dots with fellow Frenchmen Tchami, the two created "Freakin" which was debut on Tchami's EP. The two would collaborate again, when Dombresky released singles "Wait" & "Utopia" on Tchami's label 'Confession'. As the music grew organically so has the touring, having played big festivals like Hard Summer, EDC, Nocturnal Wonderland and Holy Ship. 2017 also saw Dombresky branch out with his own headline tour in international markets through Australia and China as well as playing support on Chris Lake, Anna Lunoe and Slander’s respective US tours. 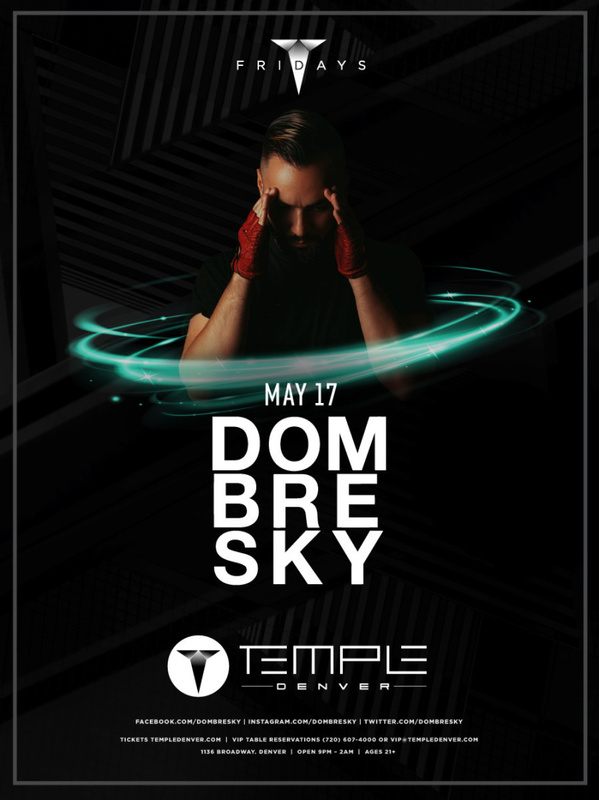 Having received overwhelming support and praise from artists from all over the world including DJ Snake, Avicii, Tchami, 4B, and Anna Lunoe, Dombresky has cemented himself as one of new faces to the international house music scene.Temple Nightclub Friday's is a venue for artists, by artists, offering a nightlife experience that is unrivaled in the Mile High region. Temple Denver features awe-inspiring, fully immersive state of the art lighting and visuals, to a thundering custom sound system, paired with world-class talent and theatrical production.